Title: DASH BUSINESS MASSIVE ADOPTION IN GHANA, WEST AFRICA. 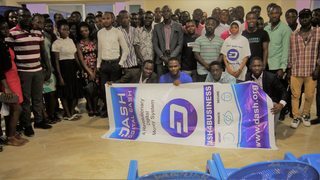 We want to build a world where dash can be spent anywhere, the project tends to augment dash business adaptation in Ghana, Training of newly 45 Dash Business Ambassadors in three regions of Ghana to reach out to many businesses in the country, Organize Dash Business master class across the regions of Ghana, expanding the already three existing Dash Exchange Centers in Ghana, increase one on one interaction with Business owners on the need to sign up with Dash Digital Cash and running of Dash Business Advertisement on Ghana’s premier Television and Radio stations. There are few businesses in Ghana that accepts Dash as a medium of exchange. The lack of businesses accepting Dash is holding back Dash users from trading with it despite the increment of Dash usability in Ghana. Our solution has to with equipping the operators of business and market traders to accept Dash as a means of payment for goods and services. Gradually cryptocurrency adoption in Africa is taking roots at an admirable pace. However, one critical area that needs a big push is merchants and business acceptance as a form of payment for goods and services. It is very indispensable since that will boost adoption and offer Africans the freedom and convenience virtual currencies brings. creation. There is no doubt the country is ripe for use of cryptocurrencies. for dash users to spend their dash. The second phase of the proposal shall cover the three-major industrialized and business areas of Ghana (Takoradi, Kumasi and Tema). more businesses sign up with dash, the number of businesses that accept Dash in Ghana as a medium of exchange can only be found in the regions we have visited so far and there is the need to spread it over to different regions and areas around Ghana, this will create a platform for Dash users to spend their dash at the nearest coffee shop, the nearest restaurant, nearest hotel etc. The reason being that until a greater number of businesses begin to accept Dash as a means of payment, people won’t start using their Dash and dash owners will always see it as an investment. Several lessons and observations have been made from our first project and there is the need to factor in new developments such as hedging of the market, Training of Dash Business Ambassadors and Dash Business Radio and TV Advertisement. A number of businesses have raised some concerns around the risks involved in the usage of cryptocurrency especially how the volatility can affect the stock of their business. In understanding what is important to the businesses in terms of daily transactions is very important and of course the price volatility of cryptocurrency needs to be handled. Hedging of the market is to take care of the risk, fear and doubt associated with accepting dash as payment. During the first phase of this project, many businesses gained a deeper understanding of dash digital cash but were unwilling to accept dash as a means of payment in their various outfits due to the volatility nature of cryptocurrency especially the recent decline in the value of cryptocurrency market prices. Volatility has been an integral component in the cryptocurrency space. In as much as cryptocurrency is associated with high level of volatility, hedging centers shall be established alongside with the Dash Exchange Centers responsible for hedging of the market. This body will hedge against the price of dash cryptocurrency by allowing businesses to record all transactions in Ghanaian cedi equivalent. This will reduce the risks associated with accepting dash as payment for goods and services in case there is a fall in dash price. Dash Business Advertisement over the nation’s premier TV and radio stations to help keep dash users informed about product and services that they can spend their Dash with in Ghana. This we believe is capable of attracting more businesses to the dash ecosystem because more value will be added to the already businesses that are accepting dash and will then serves as a catalyst to attract more businesses. Adom TV, TV3 and Citi FM which are the most watched television stations and most listened radio stations in Ghana with an average viewership of 662,000, 544,000 and 111,000 respectively will provide a platform to market Dash Digital Cash to the good people of Ghana. This will increase dash awareness in Ghana to about 1,327,000 people. this is the best platform to get dash to every household in Ghana. to many businesses as possible. More businesses will come in to accept dash as medium of payment if they realize that there is a number of businesses that accept it as a means of payment. In this regard, we shall be training 45 Dash Business Ambassadors across the places we shall be visiting, we together with the newly trained dash business ambassadors shall spread over these places to reach out to many businesses as possible. This will intensify one on one interaction with business owners on the need to accept dash as a means of payment. it as a means of payment for goods and services. After educating and introducing them to Dash Digital Cash, companies in financial services, hospitality, energy, restaurants and other industries are springing out to begin signing up with Dash Digital Cash. · We have also set up the first Dash exchange centers in Ghana, see the pictures below https://imgur.com/a/d0wm0. These offices will be served as a point of physical contact for people to walk in to learn more about Dash digital Cash. Also, these centers will be served as a place for Dash exchange throughout the country and we intend to establish a Dash Center in every region of Ghana. This will help reduce risk and doubt. this website there is a market place where people are of liberty to buy and sell anything there with dash as the medium of payment. This will strengthen more businesses to adopt dash digital as a means of payment. www.dashghana.net . Also on this website, people can now buy and sell dash directly on the platform, we have created a buy and sell order for dash where people can place order. 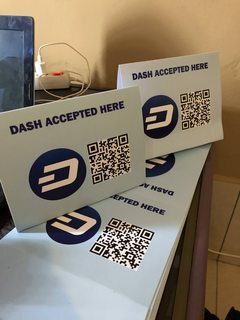 businesses so that dash users can easily scan these printed dash QR codes and pay for their goods or service in dash. See pictures below https://imgur.com/a/XT2OX. · One on one intensive interaction with business owners for massive adoption. · Establishment of Dash Hedging Centers to hedge against the price of dash digital cash. 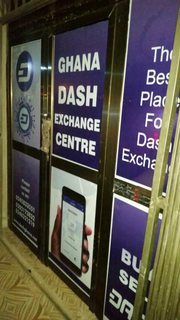 · Expansion of the existing three (3) Dash Exchange Centers across the country creating a simple and easy platform for people to exchange their Ghanaian cedi for Dash and the vice versa. · Running of Dash Business Advertisement over television and Radio stations in Ghana. "We want to build a world where dash can be spent anywhere"
Can you provide some evaluation of how much it will cost the DASH Treasury to expand your project to "everywhere"? Getting ambassadors in every region where people live and need help learning to use DASH and really pushing this program forward on a global level? Will the previously funded Ghana gifts/projects complete this year? any chance of merging any? Roughly $300K spent on Ghana referencing programs thus far, how many people live in Ghana? Thank you so much and I do appreciate your concern sir. Please sir for this current proposal , the information requested has been stated in the proposal by this I have stated the amount required for every activity to be undertaken and by that I have already established a newly office in one of the regions I have stated to run Dash programs which is Ashanti Region of Ghana which is going to be served as a #Dash Help Center and a point of physical contact for those living around this region, it has always been my desire to get an office space in all the regions of Ghana and after that more attention shall be given to the global face to get #Dash Help Centers in every sphere of the African continent and beyond. Aside the projects I am personally handling which is the Dash Business Adoption continuation project, the only Dash proposals in the country I am aware of is the Dash Road Show proposal by @cryptolib which ended and was rolled over and currently in progress and the Dash hub proposal by @Ultimatecrypto escrowed by greencandle which is also in progress. I have no idea and I have never heard of the Buy and Sell Dash directly within the wallet by rgenito and the Dash times by elishagh1 proposal in Ghana. Dashy Africa was a proposal by @rotc in Nigeria and how it enters Ghana is by he and his team. The 29.4 million population country must be enshrined with and be flooded with Dash awareness project since it has always been our burning desire of making Ghana the hub of Dash Digital Cash and going forward as a country. Since then our efforts have been seen and recognized by the good people of Ghana which has wet the grounds for so many things given Dash a centre stage in the mainstream media. Can we have a short summary of all the request for Ghana included in each Ghana proposal? Thank you so much for your request. Its great what you doing, the amount of work you are putting is really commendable. I really wish however you could spread to other countries outside of Ghana, like Ivory Coast, Togo, and other nearby countries. Specially since this will allow the DASH economic-zone to be more than just one country. That said is great that you are targeting to businesses and they are open to the idea of taking DASH. Thank you so much sir , I acknowledge your concerns and we have put plans in place on how we can reach out to other African countries that have not heard of Dash Digital and in no time we shall hit the hit walls of other African countries by that I have made contacts already in those countries and we shall soon get things going. This proposal content is clear and concise, love what you're doing and the choice of location Ghana Africa. With this proposal Dash is going to be an cash for Ghanaians and beyond. Good team. Effective plan. Well known in the community. Responsive to questions. In addition to our other Ghana-based proposals, I know some other people working in the region, so it's great to see more work being done to spread Dash there. Lately one thing the MNOs have been talking about is that it's great to get merchant integrations, but it's even more important that people actually *spend* Dash at these places. Obviously the merchant must come first, but what I'm wondering is in helping the merchants to integrate, how are you helping them incentivize their customers to use Dash to pay for goods and services? If you look at the recent CNN segment featuring Joel of Dash Force News, the area where he lives has dozens of businesses that accept Dash all in a cluster, so he's able to get most everything he needs by spending Dash. So clearly having this density of merchant acceptance is a very important and helpful step, but people also need a way of getting Dash in order to spend it. I saw on Discord that your store offers an exchange. What other ways do Ghanans have of obtaining Dash to use in stores? Thank you so much sir for your concerns, I appreciate and acknowledge that. This is the approach we think that will best suit the Ghanaian industrial setting which is mostly in a form of medium and small scale businesses controlled by single individuals or group of persons . With regards to incentives given to customers by businesses, Dash holders in Ghana are more eager looking for avenues to get spend their Dash, what we intend to do is to get them these avenues by helping them identify the places where Dash can be spent in Ghana, this forms the basis of our intention to run Dash Business Advertisement over radio and tv stations to inform Dash users where they can actually spend their dash . The split over effect is that , not only we are helping Dash users to get their Dash spent but we are also adding more value to businesses by marketing them to Ghanaian people and we believe in the long run , more businesses will get attracted and will sign up to accept Dash as payment which form the basis of this proposal. By this Dash users themselves are encouraged to spend their Dash since they can now locate the places to spend it and they will even encourage more peers to get along after experiencing how smart ,easy and convenient Dash digital cash is. To the business owner who have undergone an in-depth training on Dash Digital Cash will begin announcing to their customers ‘’ I now accept Dash as payment ‘’ and will begin questioning their customers who might haven’t heard of Dash Digital Cash: have you heard of Dash cryptocurrency ? Are you aware that the world has gone digital? Are you aware we are in a paperless economy now ?etc response to these questions will then inform the next of action against the customer in question. Thank you for your explanation and assurances. I'm looking forward to seeing what kind of a local Dash ecosystem you can build! Looks good. Fair price. A lot of potential to grow into a movement in Ghana. Keep working hard.